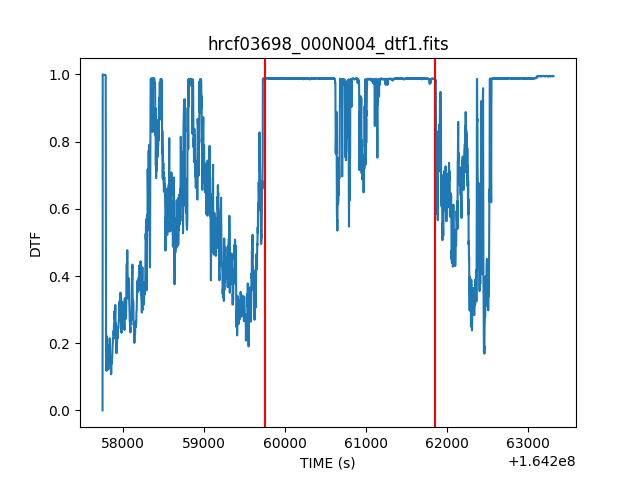 HRC deadtime corrections are determined as a function of time from detector total event and valid event counters (usually sampled every 2.05 seconds but may differ, depending on telemetry format) and written to a deadtime factor (dtf1) file. The average deadtime correction (DTCOR) for an observation is computed from the dtf1 file, filtered by the relevant good time intervals, and is applied to the corresponding ONTIME to compute the LIVETIME (and EXPOSURE) of the observation. If the user applies different time filters then the DTCOR, LIVETIME, and EXPOSURE keyword values should be updated to match. To recompute deadtime statistics from an HRC deadtime factor file (dtf1.fits) with different time filters from those used in standard processing, and to use them to update the DTCOR, LIVETIME, and EXPOSURE of the observation. This thread is needed to correct the count rates (counts/sec) when doing photometry. Light curves and exposure maps take the dtf1.fits file in as a separate input and do not require the DTCOR keyword value be updated in this way. The event file was filtered on time, changing the good time intervals (GTIs), e.g. as a result of application of a background. Time filters may also be applied if the deadtime factors have been flagged as variable in the standard deadtime statistics (std_dtfstat1) file. This thread is also required if your data was processed with software version 7.6.4 through 7.6.7: a bug in HRC standard processing led to the use of incorrect good time intervals (GTIs) in the calculation of DTCOR in the dtfstats file, and hence the LIVETIME and EXPOSURE. Get Started shows how to determine what version of the software has been applied to your data. Last Update: 18 Dec 2014 - Reviewed for CIAO 4.7; no changes. This thread should be done after any necessary reprocessing is completed (e.g. running chandra_repro). In this thread, we assume that all relevant files are in the same working directory. This example will use a time filter on the event file. EXPOSURE                  3906.1692719921           Total exposure time, with all known corr. appl. EXPOSURE                  1586.2213070130           Total exposure time, with all known corr. appl. The value in the event file is computed with hrc_dtfstats which uses data during the good time intervals and is computed using a good-time weighted average. The plot is shown Figure 1. The dead time factors are highly variable due to a combination of the bright extended source and mildly varying background. The dead time factors are highly variable due to a combination of the bright extended source and mildly varying background. The red lines indicate the time range that is being used in this example. The individual DTF values in this range are much closer to 1 and therefore the DTCOR value needs to be recomputed. Since a time filter was applied over a time range where the DTF values are different from the mean, the DTCOR value must be recomputed. 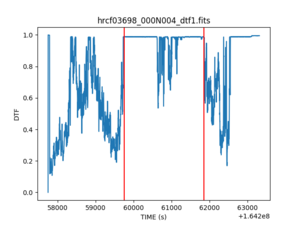 The new GTI created by the time filter needs to be used to recompute the deadtime statistics using the hrc_dtfstats tool. This tool takes the existing dtf1.fits file and creates a new file with the event GTI information applied. The contents of the parameter file may be checked using plist hrc_dtfstats. which agrees with the range of values plotted in Figure 1. Finally, we update the event list header with dmhedit. Which shows the expected change in the LIVETIME and the EXPOSURE keywords. The corrected event list, dtcorr_evt2.fits, should be used for all further analysis. (verbose = 0)               Verbose level. 15 Dec 2011 reviewed for CIAO 4.4: the hrc_dtfstats tool computes a simple average instead of an error-weighted average; minor updates to screen output. This software update makes the tool consistent with standard data processing (SDP); running this thread on recently-processed datasets will no longer introduce a regression into the data processing. 15 Jul 2014 Updated to use different OBS_ID that shows time variation within an observation. 18 Dec 2014 Reviewed for CIAO 4.7; no changes.